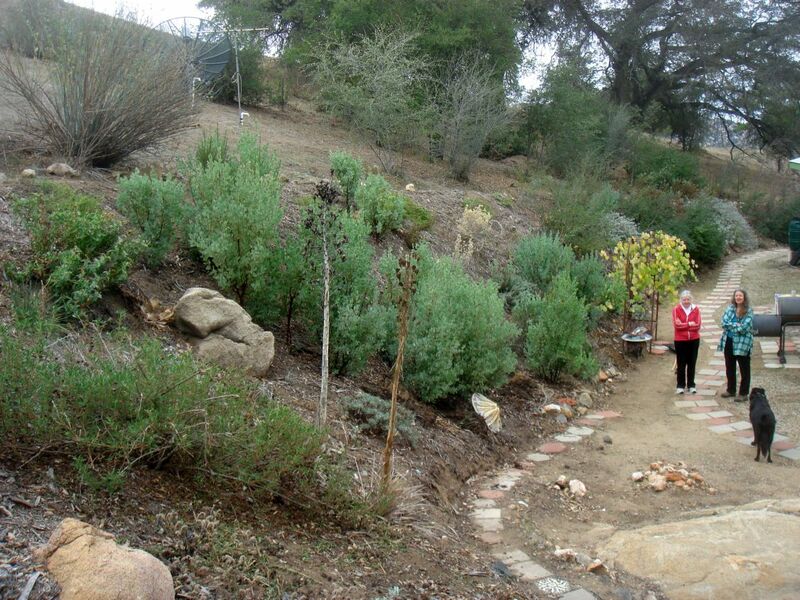 Sometime between 1998 and 2000, Julie planted two specimens of Arctostaphylos glauca at her house in Cuca Ranch on the south slope of Palomar Mountain just south of SR76 between the Palomar Mountain South Grade Road and the La Jolla Indian Reservation. Those two specimens burned in the Poomacha fire on 26 October 2007 after producing a total of something like 50-100 ripe berries. Some of the fruit was dispersed naturally. Some of the seeds were tossed back into the planted bed by Julie after she enjoyed eating the coating of the berries. Within a year or two of the fire, 17 seedlings had sprouted in the mulched bed where the original plants grew, all within a distance of 30 feet of the original plants. 15 of those seedlings appear to be pure A. glauca, but two of the plants appear to be hybrids with A. glandulosa. 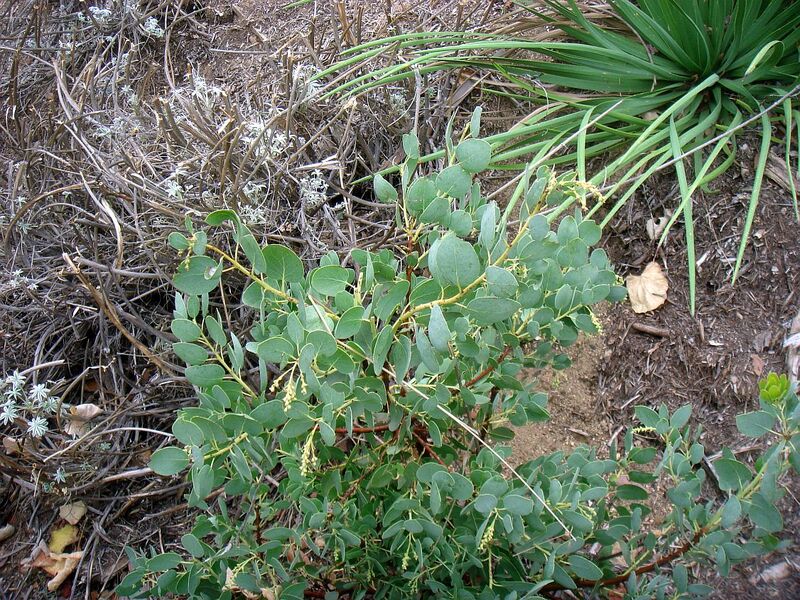 The 15 plants that appear to be pure A. glauca all have glabrous stems and white-glaucous leaves. Two of the plants have their first nascent inflorescence present this year, which are almost glabrous and have scale-like flower bracts. All of these traits are consistent with a determination of A. glauca. One of the two hybrids is obvious at a glance that it is different from the other plants because it has a different gestalt and color. Its leaves are green, not glaucous. 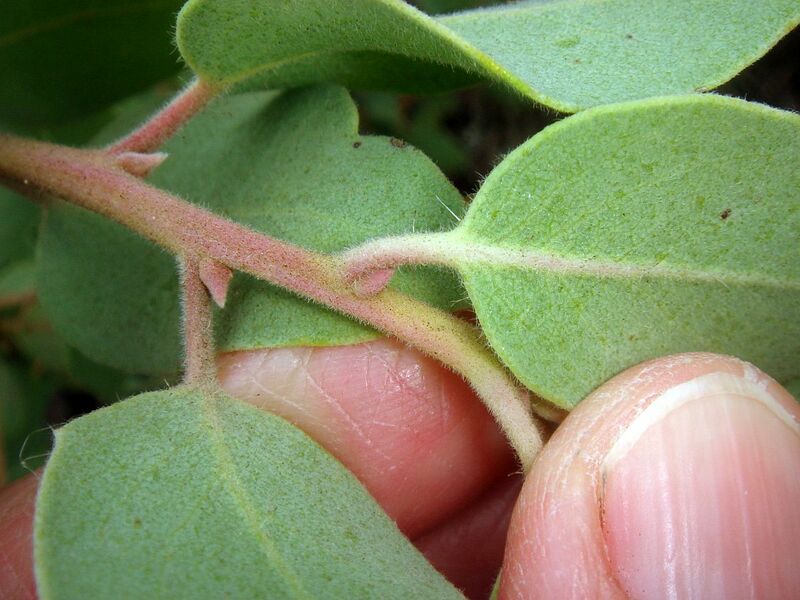 Its leaves are horizontal on the main stems, instead of the usual vertical orientation, and have very short petioles. 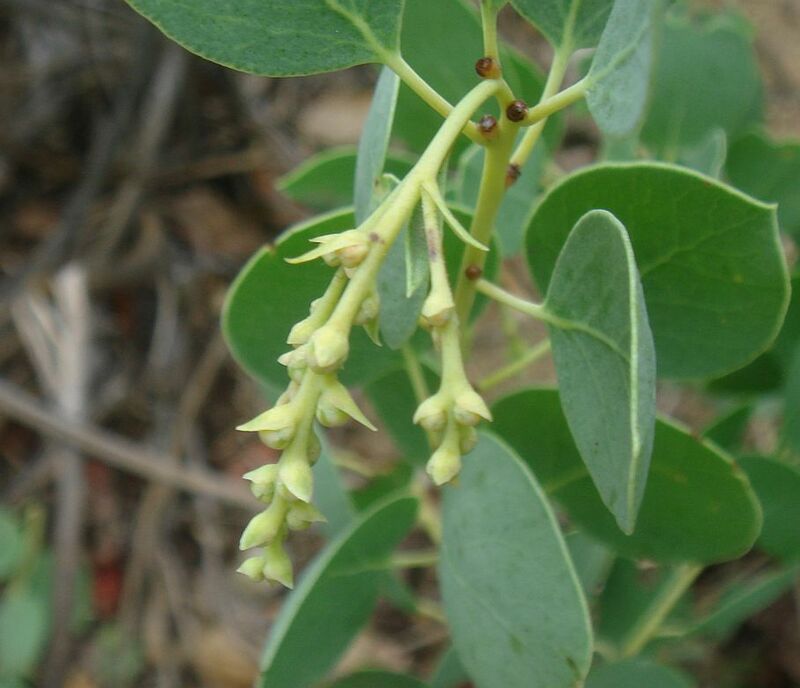 This plant also has one stem that exhibits "rank" growth, being much more robust and taller than the other stems, with dense branching at its tip. This singular stem may or may not be related to it being a hybrid; it might just be an aberrant growth form that can happen to any plant, since the rest of the stems don't look abnormal in habit. The second hybrid is not obvious at a glance. It was only discovered when Tom systematically checked each of the plants for stem hairs. This plant has stem hairs that are roughly halfway as long as those of the first hybrid. Interestingly, this second hybrid is the only one that shows evidence of burl formation. After we discovered these differences, we then could see that there was a subtle difference in leaf color as well, with leaves slightly greener than those of the pure A. glauca plants. This population seems consistent with most of the seeds of the original two plants being produced by pollen from A. glauca plants, probably from one of the two original plants but possibly from A. glauca plants in the surrounding area. 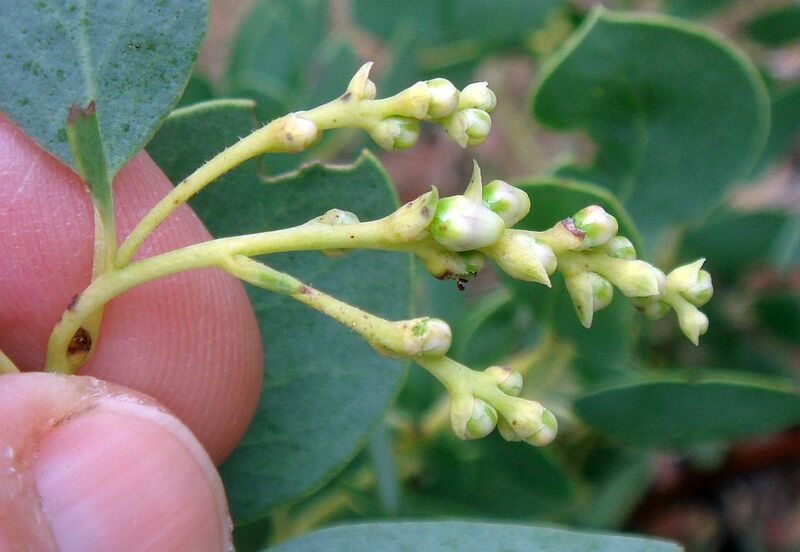 However, at least a few seeds must have been produced by pollen from plants of A. glandulosa from the surrounding area. Both of these species are common in this area. 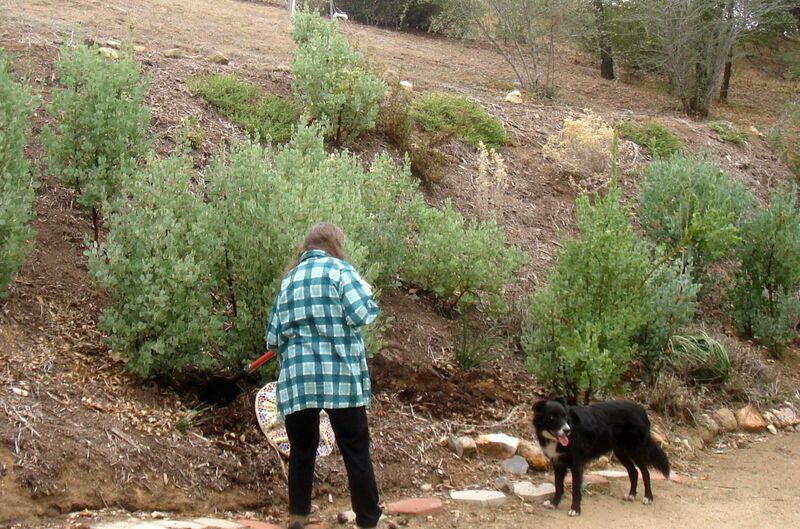 Julie has observed A. glauca plants within 0.25 mile of her house, and A. glandulosa five miles away. 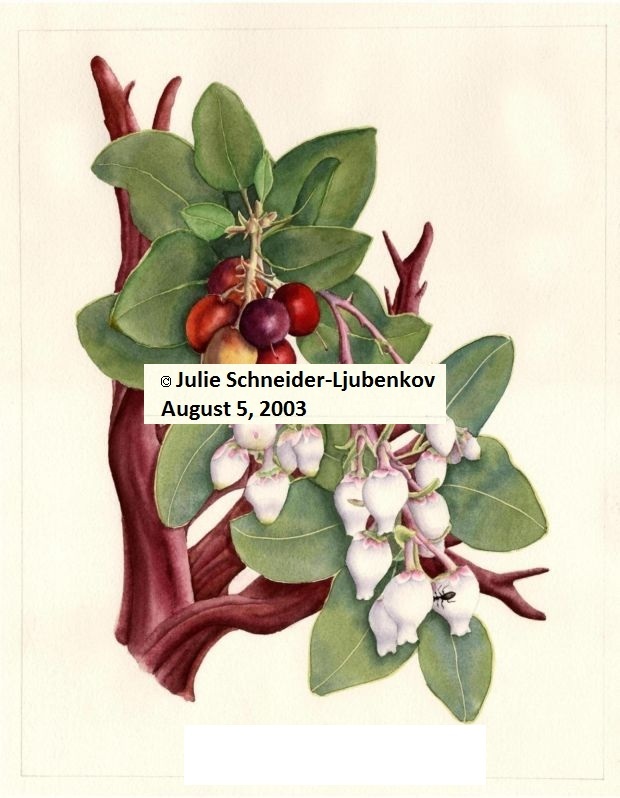 There are vouchers of A. glandulosa , with individual plants of both species five miles away both to the northwest and southeast of Julie's house. It is a little puzzling to us why these two hybrids are not uniform in expressing the different characteristics of their parents, since F1 hybrids are usually uniform. The only obvious explanation we can think of is that this variation is due to genetic diversity in their parents. This could come from the mothers, the two nursery specimens of A. glauca, being genetically diverse, and each produced one of the two seedling hybrids. Alternatively, the father A. glandulosa plants might have been genetically diverse. Or both mom and dad could have been diverse. It is of course possible that hybrid #2 is a pure A. glandulosa which just happened to come up in this small area surrounded by 16 offspring from the A. glauca seeds in this area, but the a priori probability of that happening is pretty small from the complete lack of A. glandulosa seedlings anywhere close by. 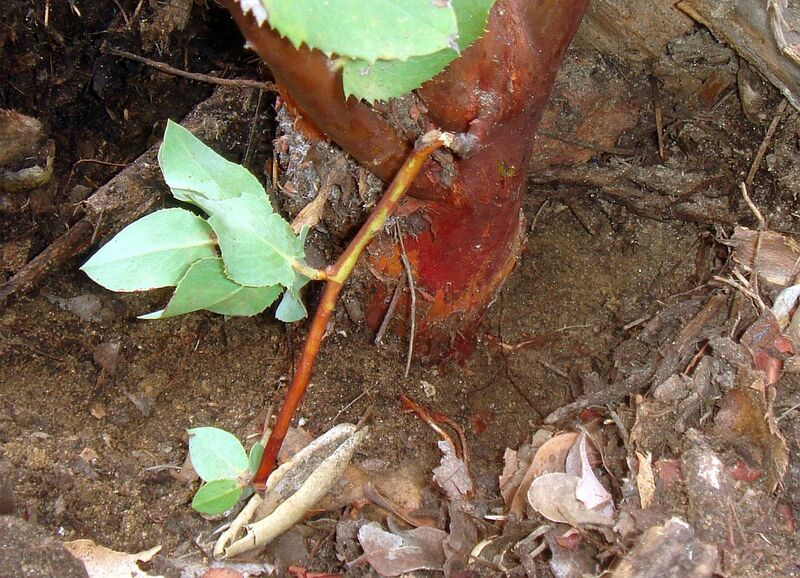 In fact, A. glandulosa seedlings are extremely rare anywhere compared to seedlings of A. glauca, since A. glandulosa normally resprouts from its burl instead of from seeds. We dug in the soil around five or so of these 17 plants, and found that the roots of these plants were as expected for seedlings, being confined to the vicinity of the plant with the usual habit at the base. We also found decayed roots of the two original plants, with no sign of any connection between those roots and those of the seedlings. It is not possible that these three morphologically diverse plants all were somehow produced by suckers from the roots of the two parent plants that survived the fire. No plant whose roots we partially exposed showed any evidence of burl formation with the exception of hybrid number two. As these putative hybrid plants mature, and produce flowers and fruit, it will become possible to do more definitive analysis to prove whether they are hybrids or pure species. 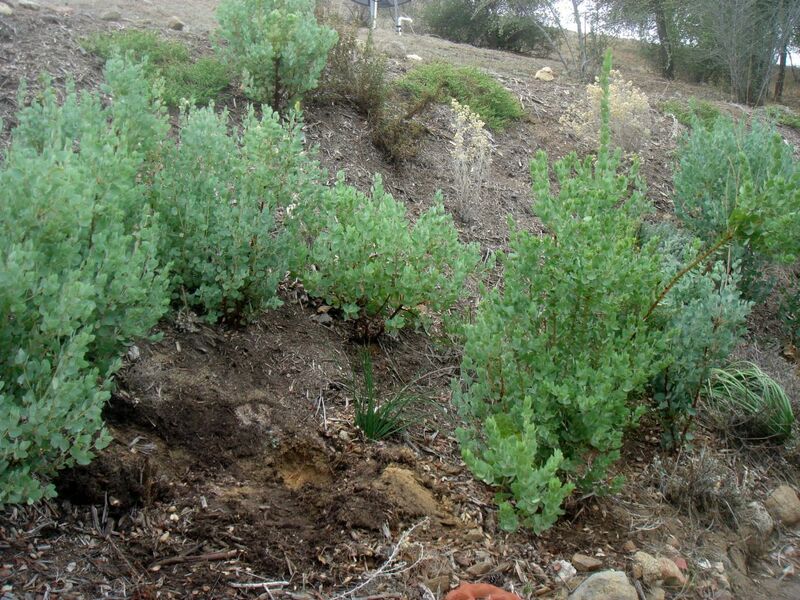 See, for example, Hybrids of Arctostaphylos patula and A. pringlei in the San Jacinto Mountains, where a Principal Components Analysis confirmed the hybrid nature of those plants. Painting by Julie of one of the parent plants from before the fire. If you would like to purchase a print of this painting, please contact Julie through an email to Tom. View of all A. glauca offspring plants in their habitat. Closer view of the two hybrids; Same picture with hybrids labeled. Yet closer view of the two hybrids. 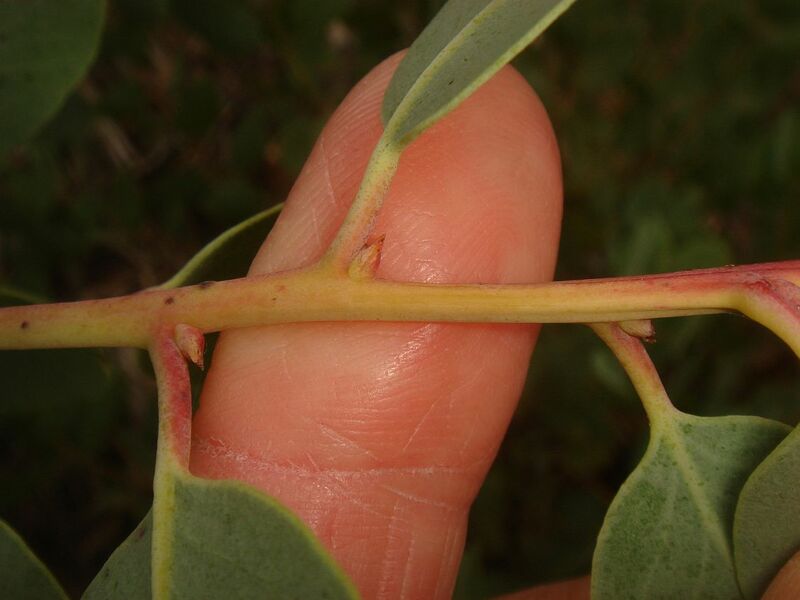 View showing a normal A. glauca twig with no hairs. 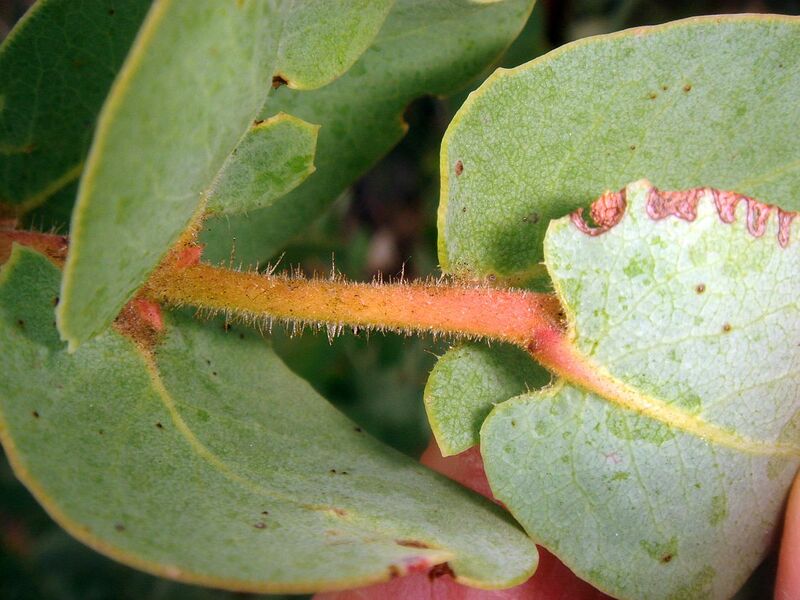 View of hairs on twig for hybrid 1. View of hairs on twig for hybrid 2. Exposed root of hybrid 1, showing no evidence of burl formation. 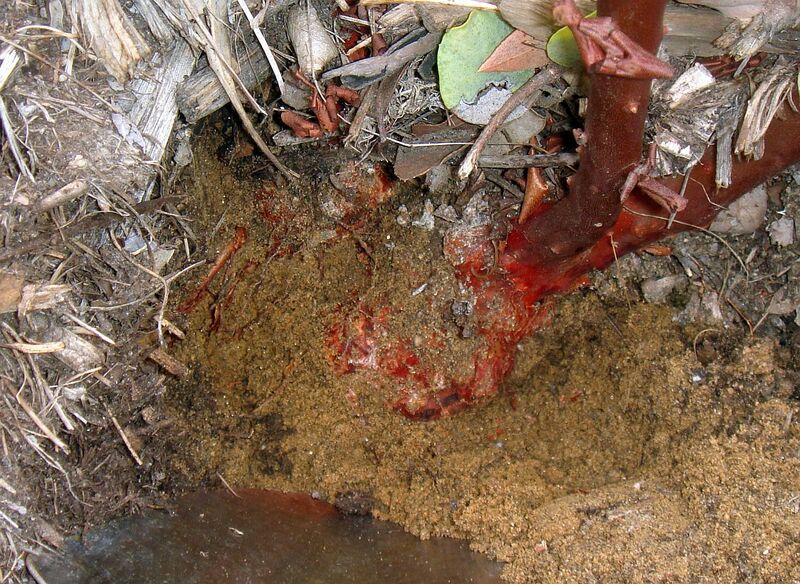 Note that the above-ground stem continues below ground as a root of roughly the same diameter. Exposed root of hybrid 2, showing young burl. Note that the above-ground stems abruptly terminate in a much wider ~globose below-ground structure that we interpret as a young burl. The shiny metal blade of a hand-trowel is at the bottom of the picture for scale. 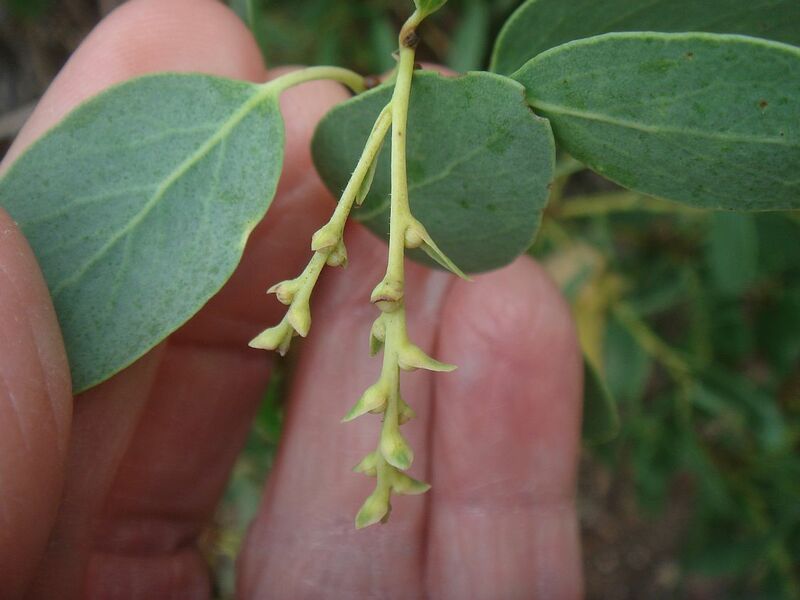 Group of nascent inflorescences on one of the 15 normal A. glauca seedlings. Close-up of one of those nascent inflorescences. Close-up of another of those nascent inflorescences. Close-up of yet another of those nascent inflorescences.